Many cryptocurrencies have followed Bitcoin, but none have been able to crack its dominance of the digital currency marketplace. 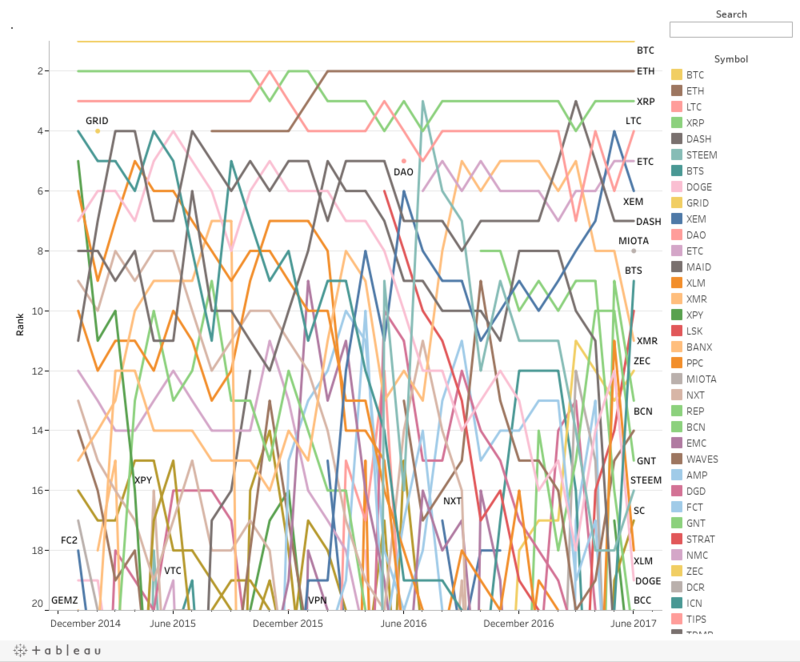 The above interactive graphic, by CryptoReach, shows the top 20 cryptocurrencies ranked by market capitalization over the course of the past 2.5 years. This ranking can teach us about the evolving market for cryptocurrencies and the direction it may take as more and more competing players emerge. The movement – or lack thereof – of market cap rankings as shown in the chart can be deceiving at first. Keep in mind that the rankings, as listed, don’t take the scale of differences in market cap (or coin price) into account. The ever-increasing valuation of Bitcoin is a great example of this. With a market cap recently reaching $40 billion, it surpasses most other cryptocurrencies on the list by an order of magnitude despite only being separated from them by a few ranking points. Just because a particular currency falls down the rankings doesn’t necessarily mean that its market cap is shrinking: it may simply not be keeping up with the growth of its peers. Dashcoin, for example, fell four ranking points between March and May of the past year despite nearly $200 million of growth in value. This simply reflects a much broader overall trend: the extraordinary speed at which the cryptocurrency market as a whole is growing in value – that is, until the recent pullback in the last month. <img src=”http://www.visualcapitalist.com/wp-content/uploads/2017/07/total-crypto-marketcap.png” alt=”Total Market Capitalization of Cryptocurrencies to Date” Some mainstream analysts have characterized the rapidly rising valuations of cryptocurrencies in the past several months with words like “insane”, stoking fears of a bubble set to burst. So far that hasn’t happened yet, but it is true that the coin universe has had a significant pullback after powering through $100 billion in value in June 2017. For anyone that follows the crypto market, they know that such volatility isn’t unusual. Bitcoin has often been either best or worst performing currency in back-to-back years through its short history. But despite this aforementioned volatility in the market, the coin universe has evolved over time to include many other cryptocurrencies. With the market assigning strong valuations to many different coins, it confirms broad interest in the sector and blockchain as a whole, while helping alleviate some signs of a “bubble about to burst”. As we can see in the above graphics and the interactive chart, Bitcoin has dominated the list of highest-valued cryptocurrency players for close to three years. However, other currencies have recently entered the mainstream, preventing Bitcoin from owning the entire market. The appearance of the more technologically advanced currency Ethereum on the market in mid-2015 appears to have challenged for Bitcoin’s share of the market, as well as ending the ongoing battle for the second-place ranking between Ripple and Litecoin. In the short span between December 2015 and February 2016 (when it overtook Ripple for the #2 rank,) Ethereum’s market cap grew nearly eight-fold. The post Interactive: Ranking the 20 Most Valuable Cryptocurrencies Over Time appeared first on Visual Capitalist.